Sickle Cell Disease (SCD) is an inherited blood disorder which constitutes a global health problem. Approximately 100,000 Americans are living with the disease. One in every 500 African Americans and one in every 36,000 Hispanic Americans is born with SCD. Many more Americans perhaps as many as 2.5 million – including 1 in 12 African Americans are carriers for Sickle Cell Trait (SCT). Given that these carriers are generally unaffected by SCD complications, many are unaware that their children are at increased risk for the disease (source: SCDAA). 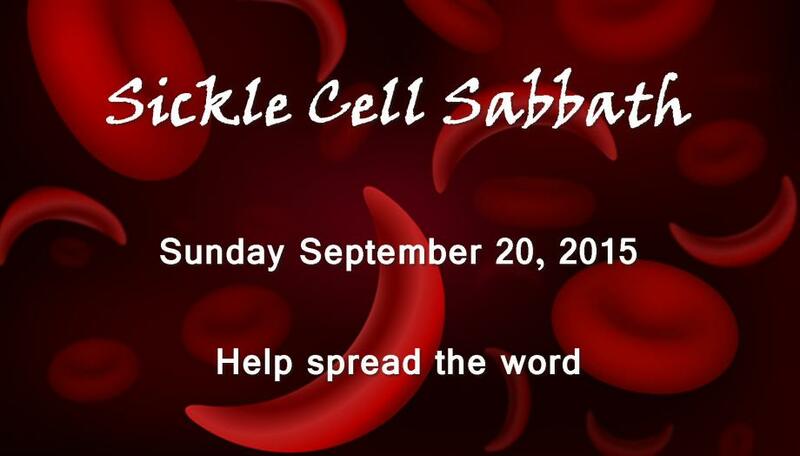 What is Sickle Cell Sabbath? Sickle Cell Sabbath is a national faith day to raise awareness and charitable giving within congregations for sickle cell disease. As a national partner of the Sickle Cell Disease Association of America (SCDAA), the National Baptist Congress of Christian Education encourages our member churches to conduct sickle cell awareness and education activities on Sickle Cell Sabbath. H.O.P.E., the Congress of Christian Education's Health Outreach and Prevention Education Initiative was formally launched during the 106th Congress Annual Session in 2011. For more information on this website: Get H.O.P.E. Special Assistant to the Congress President for H.O.P.E.